Have you smelled the Bird Refuge lately? At the moment, it stinks like rotten eggs. This is because the algae in the water is on a growth streak. Warm weather, which Santa Barbara has had a lot of lately, feeds the algae. After the algae hits an apex, it begins to die. The algae releases hydrogen sulfide, which is the horrid smell that you are smelling. The process of algae dying is called eutrophication. This process is also occurring at Campus Lagoon (UCSB) and Lake Los Caneros. 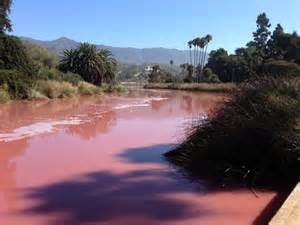 You may have also noticed that the color of the slough is bright pink at the moment. The color is a sign of an unhealthy ecosystem. The pigment of the water has changed because of a purple sulfur bacteria. This bacteria is activated by warm weather. In the past, the pond has been brilliant shades of brown, orange, and green, but never this fluorescent pink color. If you have the chance, go and check out the Bird Refuge and experience the colorful stench for yourself.